The nave is originally C12 with a north aisle. The chancel and south aisle are originally C13. 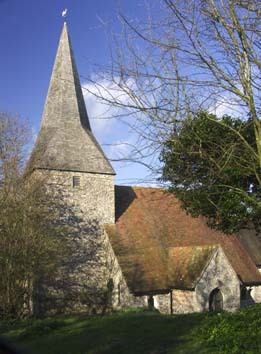 The tower is probably early C17 and the present north aisle dates from 1856. 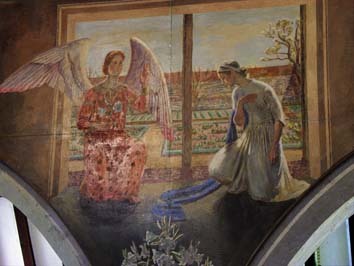 There are wall-paintings by members of the Bloomsbury group. As at Alciston and other villages under the northern side of the Downs, Berwick church is reached by a lane that leads nowhere. The scattered village formerly stood around the church, where there are now fields (SAC 114 (1976) p64). From 1846 to 1906 the rector was E Boys Ellman (he was previously curate from 1837), whose memoirs are an invaluable source on parish life. An artificial mound in the churchyard has variously been seen as a pre-historic barrow and, according to more recent examination (SAC 123 (1985) p101) a mediaeval motte. The early development of the church is unclear, but until 1856 parts of a round-headed window were visible above the outline of the north arcade (Langdon p242), so a church existed by the C12. The plain heads of the north arcade, though pointed, are only slightly chamfered, suggesting a date before 1200. In 1856 the heads are said to have been heightened by 2 ft (ibid p241), which leaves room for doubt about their present form, though there is no evidence of a change. The C13 south arcade has fully chamfered arches, an octagonal pier and equivalent responds. The abaci of the responds have been cut away to allow the arches to fit. Though mostly rebuilt, some walling of the eastern part of the aisle is old and the arch of the C17 south porch may be C13 work reset. Enough remains to show that the much altered chancel is also C13, possibly rather later, judging by the single trefoil-headed north lancet. The sills of the side-windows are linked by a string-course. Their heads are shouldered and there are shafts but all this work looks C19 and their predecessors (see below) were mostly C15. The C14 style tracery of the C19 east window is said to be based on fragments found in the churchyard (Elliott and Pritchard p236). The chancel arch dates from 1856, but the plans submitted to the ICBS imply an intention to retain the south respond from the previous one. If that is so, the shaft for the inner order of the head would be consistent with the C13, though there is nothing to suggest any of it is in fact old. In the C14 and C15, new windows were inserted in the chancel and the south aisle was altered, whilst Saunders (p11) in 1852 shows a post-Reformation east window converted from a larger one with a trefoiled head, which looks to have been C14. It is not clear if there was a tower before the present one and there is no reason to doubt that the present featureless and unbuttressed one is all of 1603, the date inside. The flintwork of the upper stage is interspersed with bands of brickwork. The tower arch, despite a round head, is too broad to be C12, nor can the tiny west window be of that date. The work of 1603 included a spire, but the present one dates from 1856. The arch of the large south porch, already noted, looks C13, but a date of 1683 (Langdon p241) for the side walls of alternating flint and brick bands is plausible. The front was refaced in the C19. In 1774 the spire was destroyed by lightning (ibid) and replaced by a low, slated pyramid, shown by Saunders. 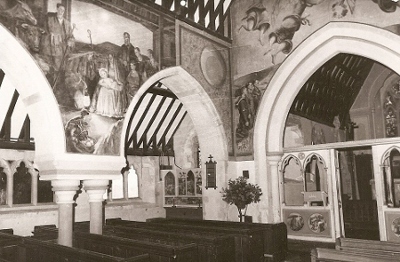 In the same year a faculty was granted to remove the north aisle (WSRO Ep/II/27/19), suggesting it had also been damaged, and to re-use its materials for a west gallery. Other post-Reformation changes shown on the Sharpe Collection drawing of 1803 could well date from then, notably the plain windows in the south aisle and the shortening of the chancel, with a reset C15 window in the new east wall of rough masonry. When the north arcade was blocked, the pier was removed and the church must have been a sorry sight before Ellman undertook the restoration of it in 1855-56. He covered much of the cost, so the sum of £845 9s 0d in PP125 must be even more of an under-estimate than usual. The architect was H Woodyer (ICBS) and his plans survive. He opened up the north arcade and provided a new pier in the form of a pair of shafts, undersized in this particular position, with odd fleurons on the corners of the abaci. Except possibly for parts of the east and west walls, the aisle behind is entirely new with windows of three and four cinquefoiled lights and pierced spandrels, a device Woodyer used elsewhere. He also replaced most south aisle windows and the roofs. A new shingled broach spire is in keeping with the area. Though he may have based his chancel arch on some old parts (see above), the head with two hollow chamfers is definitely entirely his, as is most of the chancel. He reinstated the original length and according to Langdon (p243) moved the Easter sepulchre on the north side further east. However, this is less likely if the pieces of this were in fact unearthed in the churchyard at the time of the restoration (see below). Today the appearance of the church is largely determined by the remarkable series of wall-paintings (see below), which unavoidably complicate the study of the fabric. The extent of Woodyer’s work is, however, clear and he designed many fittings, such as the pulpit and pretty certainly the screen. Both are incorporated in the scheme of paintings. These are much enhanced by the clear glass in the windows in the south side of the nave, which are the consequence of war damage that also affected the roofs. In 2010, the south porch was re-opened for regular use by R Crook of J D Clarke Architects. The project received an award the following year from the Sussex Heritage Trust (see the Trust’s website). 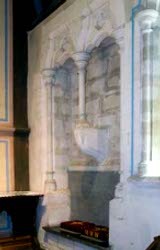 Altar-rails: These are almost certainly by Woodyer since the proportions and form of the openings relate to his screen (see below). .
Easter sepulchre: (North chancel) A large cusped arch under a traceried and crocketed gable. It is C14 and the fragments were found buried in the churchyard at the time of the restoration. Font: Crude and plain, semi-circular bowl, fixed against the west wall. It is made up of several stones that broaden towards the base and parts could be older than the present church, perhaps C11. Glass: (East, chancel side and south aisle east windows) J Powell and Sons, 1909 (CDG 183 p51) in memory of Ellman. The East window is designed by E Penwarden who also worked on the smaller ones with W Aikman and F Mann (Hadley list). 1. (Moved to tower and concealed alongside the organ) John Nutt, rector, (according to the original inscription he died in 1656, but this was later rather faintly amended to 1653, the correct date (Llewellyn p35)) and his wife; there has been another correction to the inscription, with the alteration of ‘Boxhill’ to ‘Bexhill’; Cameron Newham suggests these changes were made when the inscription was amended after the death of his wife in 1661 (Personal communication). This was originally on the north side of the chancel where a related floorstone is still to be found, though now concealed (ibid p33). When last fully revealed in 1979 it was found to be damaged (ibid p35). It consists of two complacent- looking busts in oval recesses, with swags of flowers and a coat of arms above. This has been variously attributed to E Marshall (ibid) and J Stone (BE(E) p115). 2. (Moved to tower and concealed behind the organ) Louisa Elizabeth Smith (d1821) by C R Smith (signed). It is said to be in poor condition (ibid). Paintings: These were done in 1941-42 as an expression of hope in the most difficult period of World War II (much of the following information comes from 2 and 3). 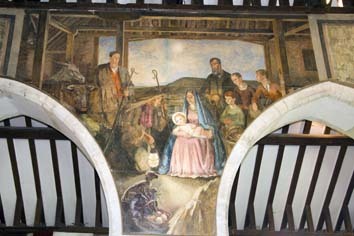 The scheme was encouraged by Bishop George Bell of Chichester who was inspired by the mediaeval wall-paintings found elsewhere in Sussex (particularly the so-called ‘Lewes Group‘). Overall responsibility lay with D Grant, who lived nearby at Charleston with V Bell who was also much involved, though the work was done in a barn nearby that belonged to J M Keynes. He was one of those who offered advice and material support, along with John Christie of Glyndebourne (the proprietor of a building works among his numerous enterprises) and Kenneth Clark, at whose insistence the paintings were done on removable panels of plasterboard in case restoration became necessary, as it has. The architectural co-ordination was by F Etchells, who spoke strongly in favour of the project against the objectors at the Consistory Court (3 p80). The landscape and the models came from the locality. 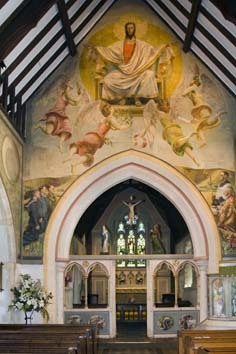 Grant’s Christ in Majesty above the chancel arch dominates the church, with portraits of Bishop Bell (not a relation) and the rector. Some detail today may initially seem over-sentimental, like the three kneeling servicemen and even the Downland setting, but in the context of the national emergency of the time such doubts are overcome and the composition is worthy of its position. It is nevertheless curious, as Simon Watney has pointed out (3 p81), that almost none of those involved had either religious sentiments or strong patriotism. On the side walls are V Bell’s Annunciation and Nativity. They lack the intensity of her earlier landscapes, but despite rather stiff figures, show her continued feeling for colour. 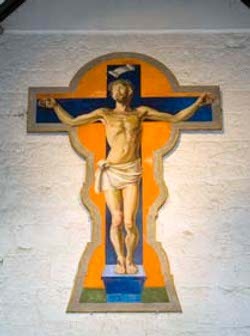 Above the tower arch is a painted crucifix by Grant. In the awkwardly shaped space above the east side of the chancel arch is Q Bell‘s (Vanessa’s son) Wise and Foolish Virgins. These extend onto the side-walls of the chancel. 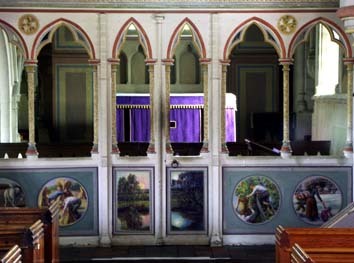 The front of the screen has small roundels of the four seasons by Grant and on the other side six small panels of the sacraments in seemingly Victorian settings by Q Bell. 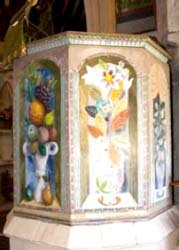 He also painted the pulpit with flowers and fruit in 1962 after Vanessa’s Archangels had been vandalised, though the thin panel of flowers on the left is thought to remain from her work. Also by Q Bell is a painting of the supper at Emmaeus of 1944 originally placed behind the altar but moved in 2005 to the north aisle. Screen: Optimistically described as mediaeval by Harrison (p27), but very much in Woodyer’s style and probably all by him, though the timbers are said (parish guide) to come from the former roof. Sedilia: By Woodyer, with shouldered heads and a centre shaft on a bracket.